This is a fun event with a pre-party all rolled into one! If you enjoy car shows, check this out. What: Car d’ Alene PRE-FUNK parking lot party. Say what! Hang out before and get a delicious brew before seeing some classic cars and trucks. 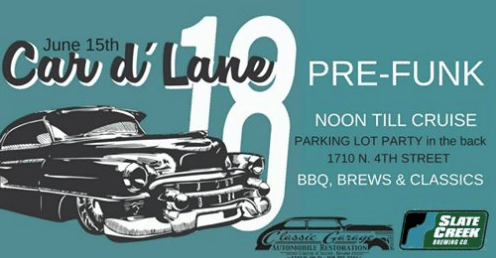 Hosted by:Classic Car Garage and Slate Creek Brewing Co.
What:A parking lot filled with classic cars, good brews, BBQ food. Doors to the shop and brewery open at noon. As they say, get your PRE-FUNK on before the cruise at 6:30 on June 15thin the parking lot in the back of 1710 N 4thStreet. Main Event – Car d’Lane 28th Anniversary Car Show! Details: Car D’Lane is a classic car weekend for 1980 or Pre’80 cars and trucks. The Cruise happens on Friday from 6-9pm. It’s free for spectators to watch while the cars and trucks roll by, shoot flames and sound horns. Saturday you can get a closer look at the Show and Shine (8am-4pm) where you can meet the owners, check out vendors and get something to eat. Also a Great way to Support Local Charities!